If you’re like most people, you make New Year’s resolutions. Some resolutions get recycled from year to year, perhaps “I’ll exercise more,” or “I’ll get more organized.” This year try something different. Make – and keep – 7 every day resolutions for your eyes. After all, your eyes are critically important to you every day of the year. Some of the most serious eye diseases, including glaucoma, diabetic retinopathy and age-related macular degeneration, tend to run in families since they have a genetic component. Knowledge is definitely power! Younger people in particular may not be aware that a relative had a hereditary eye issue that could have been passed on. If you know your family’s medical history, including eye health, you can alert your doctor. Treatments are most effective when a problem is discovered early. 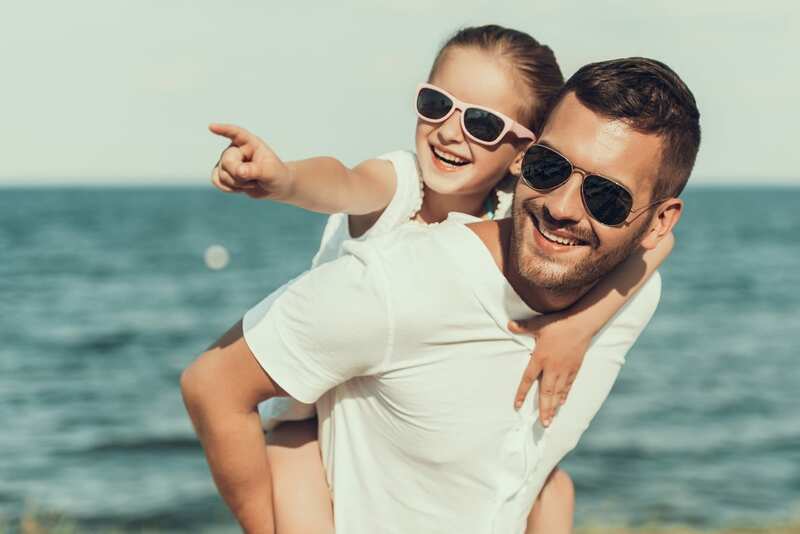 In Florida, it’s tempting to forget about sunglasses when it’s a little cooler, but the sun’s ultraviolet rays are always present. Select sunglasses that make you look great, provide the eye protection you need, and wear them every day. If you spend time near the water, one of the great benefits of living in the Tampa Bay area, eye protection is especially important. Glare from the water is particularly hard on your eyes. Talk to your eye doctor about custom sunglasses that offer maximum UV protection for your unique eyes and lifestyle. Some contacts have built-in UV protection. Wide-brimmed hats that showcase your style also help protect your eyes. Check out our blog to learn which type of UV protection is best for you. Eye injuries are among the most avoidable of all accidental injuries. In the U.S., more than 2.4 million people suffer from accidental eye injuries. Any eye injury is extremely serious and can severely impact how well you’re able to perform many of your daily activities. It may surprise you, but nine out of ten eye injuries – almost 2.2 million injuries – could have been prevented. Wearing proper eye protection can prevent that shard of metal or sharp pebble or sliver of wood from impacting and piercing your eye. Continue to live life to the fullest, especially here in Florida where outdoor living is enjoyed almost every day. Protecting your eyes can help ensure you’ll continue to be able to do the things you love. While better than nothing, prescription glasses or sunglasses can’t substitute for wearing the proper eyewear for the activity. Find out what type of eye protection is recommended for your activity and make a resolution to always wear eye protection. If you’re a young adult between 18 to 45, you are most at risk of injuring your eye. When you think about, that makes sense. You’re a busy person, both at work and at home. You might like to “relax” with friends in a hard-fought game of baseball or basketball. Swimming, diving and water sports are great ways to keep in shape. Sports eye injuries are very common. While an eye could be injured during any sport, some present a higher risk than others. Kids 14 and under suffer thousands of eye injuries every year after being hit in the face by a ball or elbow while playing baseball, basketball, tennis or paintball. Any time an activity involves a ball or fast-moving object, protecting the eyes should be a priority. Products you probably have in your kitchen or bathroom cabinets or in the garage are responsible for about 125,000 eye injuries every year. While potent cleaning products such as oven cleaner and bleach can be very dangerous, especially if misused, more accidental eye injuries happen while working in the garage or around the yard. Burns from hot cooking grease or oil splatters have caused too many emergency visits to an eye doctor. However, tools, especially power tools, cause more cases of temporary or permanent blindness. Hammering a nail into a hard surface can turn the nail or brick or cement shard into a projectile aimed at your eye. Whenever you’re working with tools or chemicals, your eyes need protection. Mowing and trimming, jobs done twelve months of the year in Tampa Bay, can become so routine you get careless. It only takes a second for a bit of yard debris to turn into a missile. Of course, you always want to be sure no one is standing too close to where you’re working for their own safety. When you’re tying down a load, be especially careful. Bungee cords, in particular, can whip back if not firmly anchored and hit you in the eye. The important point to remember is that any eye injury should be seen immediately by an experienced eye doctor. Immediate treatment can make all the difference. Call our office at 813-681-1122 for emergency care or go to the ER. A few toys are inherently dangerous. During the holiday season, you might see TV segments about recalls after kids were seriously injured by certain toys. Many toy injuries, however, happen when a child is hurt using a toy that isn’t appropriate for the age of the child. Model-building is a great activity for older kids, but a very young child could swallow and choke on one of the tiny pieces. In general, anything with a point, such as a toy fishing pole or sword, can be problematic. While projectile toys in general are typically prohibited, many parents make an exception for those shooting a soft, spongy projectile. While these are often considered safe, some can shoot for 75 feet. At close range especially, even a soft projectile can be moving fast enough to injure the eye. Silly String and similar toys contain irritating chemicals that can cause chemical conjunctivitis, a form of pink eye. If shot into the eye, corneal abrasion can occur, potentially resulting in a serious eye infection. If you use laser pointers giving presentations at work, don’t let a child play with it. The intensity of the light in professional-grade laser pointers can cause permanent loss of vision. When buying toys or examining gifts, check for the letters “ASTM.” This means that the American Society for Testing and Materials has tested the toy and verified the toy met safety standards. Remember when you were first able to leave your glasses behind and smile at the world you saw clearly with your new contacts? Many people are meticulous about following the “contact rules” at first but ease off over time, not taking proper care of their contacts or wearing contacts longer than was recommended. When lenses have expired, throw them away. Following your eye doctor’s instructions helps protect you from eye infections and abrasions. Contact lenses are normally very safe and relatively few people have problems. However, not following the contacts protocol puts you at risk of eye infections. A serious problem could even result in permanent loss of vision. Resolve to treat your contacts with the respect your eyes deserve. Today, everyone is getting a lot more screen time than they realize on phones, tablets, laptops and desktops. We spend hours staring at the screen at work, home or anywhere we happen to be. Screen sizes range from large computer screens to tablets, smartphones or tiny watch displays. Computer Eye Syndrome is almost a given. After many hours of intense focusing, it’s common to experience tired and dry eyes, blurry vision and headaches. You might find yourself stretching and rubbing your aching shoulder or neck. The solution is simple: the 20/20/20 rule. After 20 minutes of screen time, look at something about 20 feet away. Keep looking at this distant object for a minimum of 20 seconds. It’s easy to lose track of time, so program your devices to remind you to look up every 20 minutes until it becomes a habit. Following the 20/20/20 rule will relieve some of the eye strain, a major plus for your vision. Protect your vision and the vision of your family members. Can you imagine what it would be like if you couldn’t see the faces of those you love or if you couldn’t drive? What would it be like if you had to interact with the world without your eyesight? A comprehensive eye exam fulfills many functions. It tracks any changes in your vision since your last visit. Your eye doctor will screen you for any possible eye diseases or issues. You’ll get an updated prescription for glasses or contacts. Granted, you have to allow an hour or more for the visit, but protecting your eye health is well worth it. Florida Eye Specialists and Cataract Institute wishes you a happy and healthy New Year. Since 1981, Florida Eye has been committed to caring for the vision of all those in the greater Tampa Bay area with convenient locations in Tampa, Brandon, Sun City Center, Ruskin and Riverview. We are proud to offer the premier eye care and surgery center on Florida’s west coast. Every member of our team at Florida Eye Specialist and Cataract Institute is committed to providing the best possible care to all. Contact us today or call 813-681-1122 to schedule a comprehensive eye exam.